← Nothing But A Great Time At The Rapids!! The Wake Up Tour featuring Me Talk Pretty settled into Rochester, NY Thursday evening. The show at The Club at Water Street brought an end to the first leg of the tour which will resume in mid January with another leg. With the holidays upon us, the relatively small crowd were the winners as MTP, Madina Lake and Still Standing delivered a fast paced show that left them begging for more. Hailing out of the New York club scene, Me Talk Pretty (MTP for short) was formed by singer Uliana Preotu and guitarist Leon Lyazidi in 2006. This tour marks the first-ever headlining tour the band has undertaken. Starting off with “Hey Boy” they never seemed to let off the throttle until the piano was rolled out for a stripped down version of “Say You Will”. The band appropriately closed the show with their current single and the name of the tour “Wake Up”. You can hear many influences throughout their songs. Incubus, A Perfect Circle, and Bjork are some of the earlier influences of the band, however I can also hear some early Blondie mixed in with some Evanescence. 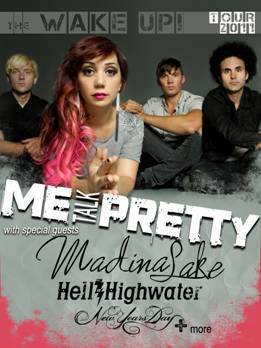 If Me Talk Pretty plays in your town, my suggestion is do not miss the show. Also on the bill were Madina Lake, a four piece band out of Chicago. The majority of the crowd seemed to be quite familiar with the band as many seemed to know most of their songs. They are currently touring in support of their latest release World War lll. Still Standing were also on the bill and had just recently joined the tour when Hell Or Highwater were forced to drop off. Formed in 1998 in Philadelphia, brothers Justin and Johnny, caught the attention of famed Aerosmith producer Marti Frederiksen who worked with the band.